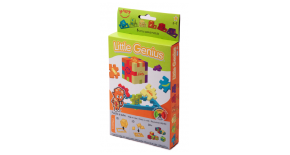 The Little Genius is the easiest version of the Happy Cube Puzzle Family. It has been especially created for children between the ages of 3 to 7. These cube puzzles are easy to build and to combine. To improve the recognizability for the little ones and to stimulate their command of language, there are symbols such as animals, fruits and vehicles printed on the puzzles. 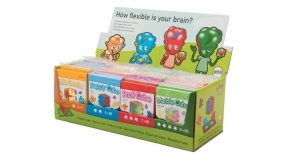 Each of the six foam Little Genius cube puzzles has a different shape, colour, solution and symbols. Every model has it’s own name which refers to the symbols printed on the puzzle. For example, on each puzzle piece of model fruits, a piece of fruits is printed. Get creative and astound friends and family with your impressive puzzle masterpieces! Combinations are possible between two or more cube puzzles. 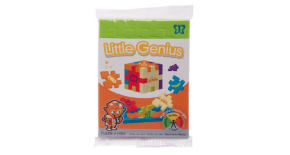 This eco packaging includes 6 different Little Genius cube puzzles, with an increasing difficulty. 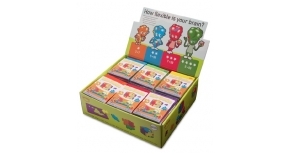 A Little Genius Counterbox contains 60 foam puzzles (6 difficulties x 10). 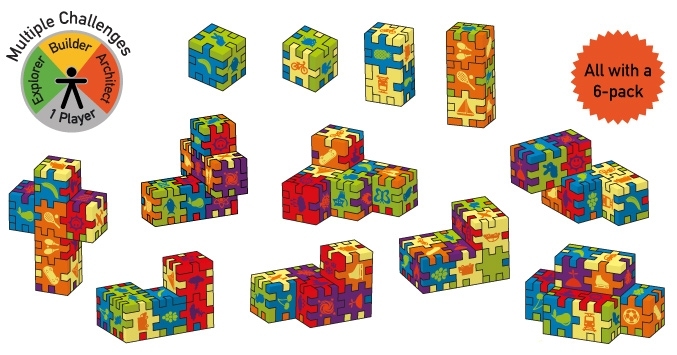 Single foam puzzles are individual packed in a flowpack with an instruction card. This combidisplay holds 48 puzzle cubes. All the models of the Happy Cube Puzzle Family are (two times) inside. This display holds 12 puzzle cubes: three puzzles of each version of the Happy Cube Puzzle Family.